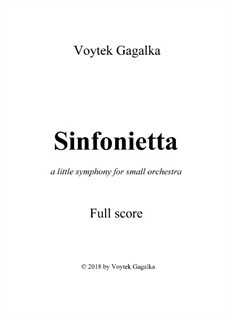 "Sinfonietta" (little symphony) or "a little symphony for small orchestra" (as it is described on its title page) was created within a month of July 2018. It is arranged for small orchestra of single woodwinds, two horns, trumpet, timpani, harp and reduced section strings, for an orchestra containing between 23 and 28 players only. From them, only "Lullaby" is based on my previous work, here substantially reorchestrated and expanded. At the time of its original creation (1992), I did not know that it "belonged." And quite naturally so. Package includes full score and parts.